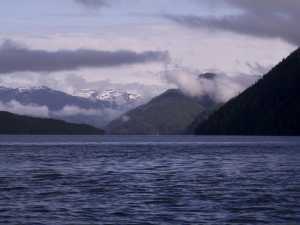 ------The Passage north from Washington through coastal British Columbia to Southeast Alaska is one of the finest wilderness voyages possible in a small boat. 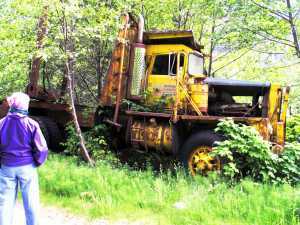 These tales record a few experiences to give a flavor of this marvelous trip to the north. ------Transportation is harder here than in most other parts of the country. 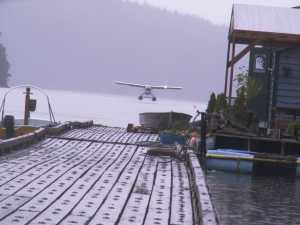 The land is rugged, most towns aren't connected to the Outside by roads, the sea is often rough, and the stormy, foggy weather can ground flights for weeks at a time. 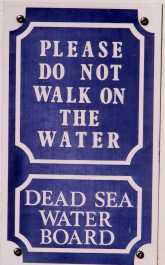 But, like anywhere, here one travels by land, sea, or air. 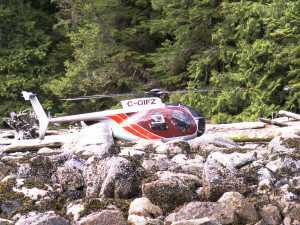 ------This is certainly the most difficult way to get around, for most of the coastal people. 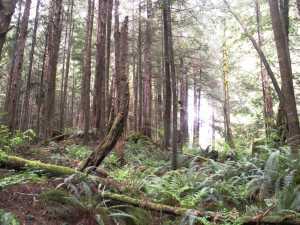 The terrain is difficult and the rain forest is dense. 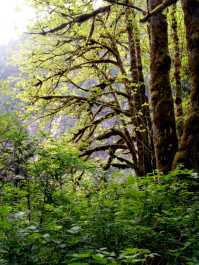 There are few roads, except in some of the towns, and they end within a few miles. 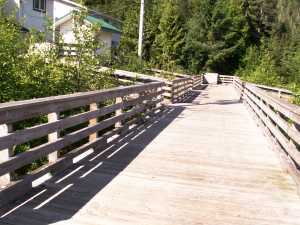 -----Towns often have boardwalks to make wet weather walking easier for inhabitants. Almost everyone wears fishing ('gum') boots since it is so often raining here. 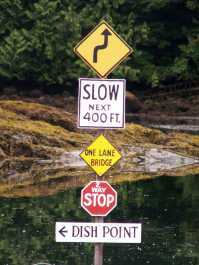 Road signs become a curiosity along those board walks. 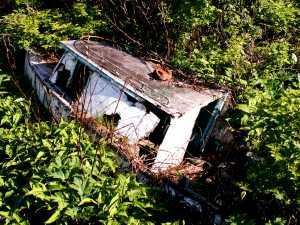 Vehicles, once there useful lives are over, are abandoned and quickly the vegetation takes revenge. 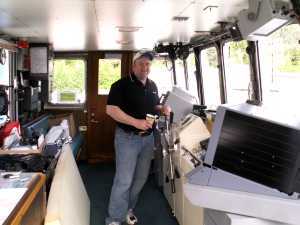 ------Water is the common denominator among the coastal and island communities of the Pacific Northwest, so naturally water transportation has traditonally been the major means of transportation for the past 13,263 years (give or take a few). The first human residents likely arrived by boat and today's residents often still arrive and depart by water (but not walking on the water). ------A common denominator all along the coast are the ferries. In Alaska, they are called the marine highway and are supported by highway taxes. 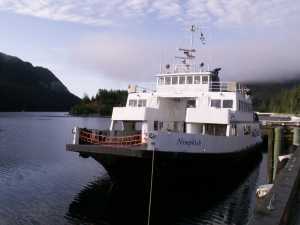 Ferries serve local island people and also the long-distance needs for people, vehicles, and goods. 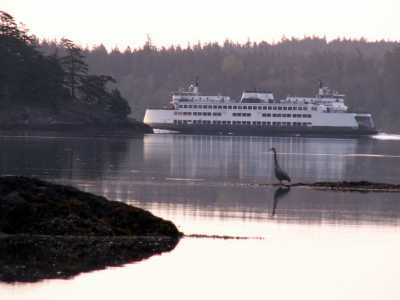 One can travel by ferry from Washington state to Alaska on the 'Blue Canoes,' the Alaska ferries. ------Travel alfoat is not without its perils. 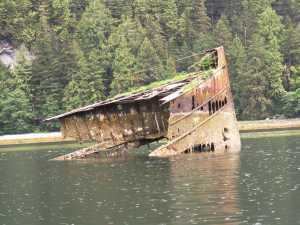 In 1909 the steamship S/S Ohio hit an uncharted rock in Hiekish Narrows, northeast of Klemtu. 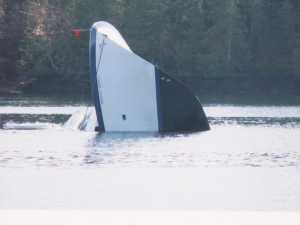 The captain of the sinking ship bravely drove his vessel into the shallows of Carter Bay and beached her. Due to his quick action and resolution, all aboard were saved. The bow remains today at the site of the beaching. Two grizzlies walked the beach off the bow when we visited her remains. ------Many accidents are caused by human error, often compounded by fog or heavy weather. The Safari Spirit nailed that rock - the rock merely shrugged but the Spirit went down. 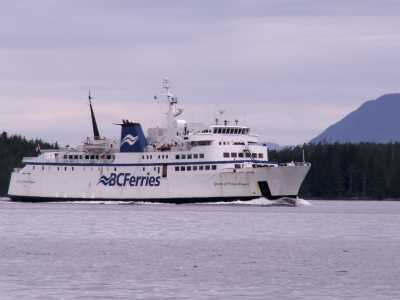 ------In late March 2006, The Queen of the North, the flagship vessel of the BC Ferry System, drove into the side of an island on a clear calm night. Two were lost, although it took her 45 minutes to sink. 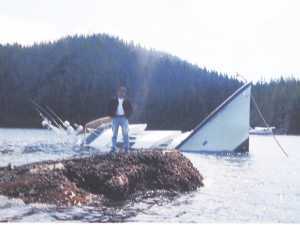 The 99 others aboard abandoned ship to life rafts and were taken to the town of Hartley Bay to be tended by the local residents who had manned their boats to come to aid. The cause of the accident is under investigation. El and I had journeyed north on the Queen years ago when we were first exploring this coast. 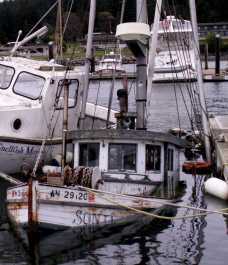 ------Not all sinkings occur from accident or weather -- the almost hundred-year old Sonja went down, quietly, overnight at her dock. Within twenty-four hours she was raised, although severely damaged by salt water. Others pass away, abandoned on a beach, with a deep sigh. ------Travel by air is the most convenient, but expensive, method of travel. Emergency evacuations for health reasons are by air. 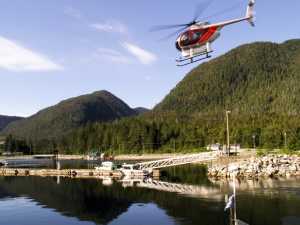 Many crew changes at floating logging camps, fish farms, or ferry crew changes are also by air. We saw air used by school boards making inspections of remote schools, for wealthy fishermen from Outside, and for business reeasons.